SC16 is excited to hold another nail-biting Student Cluster Competition, or SCC, now in its tenth year, as an opportunity to showcase student expertise in a friendly yet spirited competition. Held as part of SC16’s Students@SC, the Student Cluster Competition is designed to introduce the next generation of students to the high-performance computing community. Over the years, the competition has drawn teams from around the United States and around the world. The Student Cluster Competition is an HPC multi-disciplinary experience integrated within the HPC community’s biggest gathering, the Supercomputing Conference. The competition is a microcosm of a modern HPC center that teaches and inspires students to pursue careers in the field. It demonstrates the breadth of skills, technologies and science that it takes to build, maintain and utilize a supercomputer. Teams of six students each are selected via a team proposal process described here: http://sc16.supercomputing.org/studentssc/student-cluster-competition/team-proposal-guidelines/. The selected teams work with their advisor and vendor partners to design and build a cutting-edge, commercially available cluster constrained by the 3120-watt (26-amp) power limit. This cluster should be designed to accommodate a variety of HPC workflows. Workflows may range from being limited by CPU performance to being memory bandwidth limited to I/O intensive. 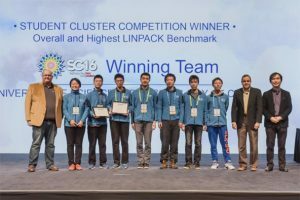 The application reviews have been completed and the SC16 Student Cluster Competition (SCC) committee has invited 14 teams to compete in this year’s event in Salt Lake City. The teams hail from across the U.S., as well at Asia, Europe and South America. Teams must also learn the four open-source competition applications, which are listed in the “Competition Applications” section on the website, http://www.studentclustercompetition.us/ for the current year. Teams are encouraged to enlist the help of domain specialists to assist with building, tuning, and understanding how the applications work. Teams are also encouraged to examine the performance characteristics of these known applications when designing their system. A mystery application will be revealed prior to the official competition kick-off. Keep in mind that the resulting system will still have to support the mystery application. Teams will assemble, test, and tune their systems on the weekend before the competition officially begins with the execution of the benchmarks on Monday. The teams will be given access to their booth and shipped systems on Saturday morning and have until Monday morning to assemble, test, and tune their systems. A final configuration must be chosen by Monday morning when the benchmark phase begins. The benchmark will be executed on Monday morning and results provided to the committee. It may be run several times with the best result submitted. On Monday night at the Exhibit Opening Gala, teams will be given the competition data sets for all applications including the mystery application. At this time the mystery application will be revealed. In full view of conference attendees, teams will execute the prescribed workload while showing progress and science visualization output on large high-resolution displays provided by the conference in their booths. Teams race to correctly complete the workload during the competition period until the close of the exhibit floor on Wednesday evening. The showcase portion of the competition allows teams to show off what they’ve learned and what they can do with their equipment. Veteran HPC experts will be present to judge the visualizations and to interview each team on their cluster and application knowledge. In addition teams will be judged on engagement activities such as Posters, team presentations and participation in the technical program. The winning team will be determined based on a combined score for workload completed, benchmark performance, conference attendance, and interviews. Recognition will be given for the highest LINPACK performance. The winning teams will be recognized at the Awards Ceremony luncheon on Thursday. Frequently updated information about the competition details can be found at http://www.studentclustercompetition.us.